Granola is one thing that I love to make at home, and pretty much refuse to buy in store. Why? When you make it at home, 1) you know exactly what’s in it, and 2) you realize what a price-gauge the store-bought stuff really is. My problem for awhile though, was getting granola into clusters. At first when making it at home, I’d end up with a bunch of tiny, crunchy oatmeal flakes … which tasted good, but were nothing like the chunky, delicious stuff you can buy in stores. I’ve now found several recipes/techniques to end up with clustery granola (use egg whites, make a wetter mixture — like with pumpkin puree — and squeeze the granola into clumps prior to baking …) but recently made easily the best batch ever. 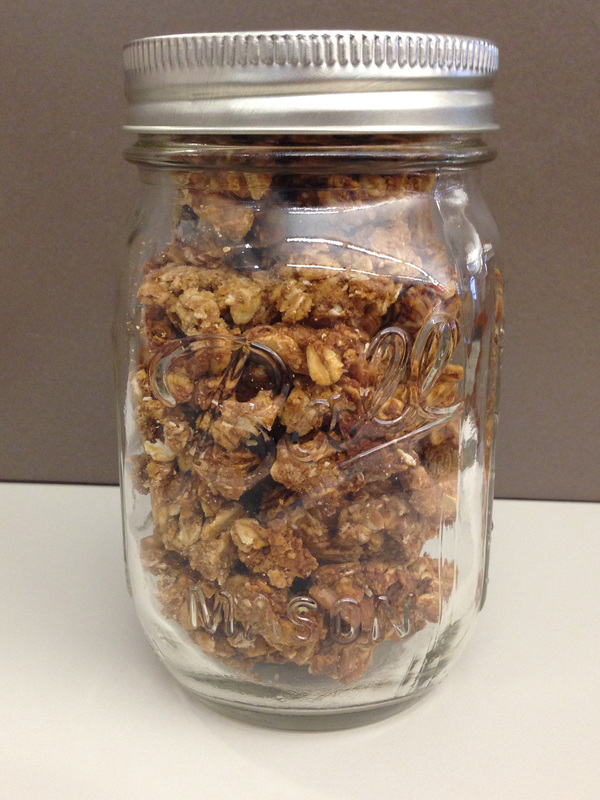 The best secret for big-cluster granola in my book? Nut butter. Depending on how sweet you want it, and what kind of nut butter you use, play around with this. Like if you have standard peanut butter, I’d go lighter on the syrup; if you have natural/unsweetened nut butter you may want to use more. Line a large baking sheet or jelly roll pan with parchment paper or a silpat. Whisk the wet ingredients together in another bowl. Combine the dry and wet mixtures together in the bigger of the two bowls. Pour the granola mixture onto your prepared baking sheet and spread it out as evenly as you can. Bake until done. Ours takes about an hour to an hour and fifteen minutes. Every 15 minutes or so, take it out and turn/stir the granola. You should have clumps of varying sizes by the end. After about 30-45 minutes, start testing it for done-ness. You want it to be slightly darker than when it went in, and crisp. We try to take it out right when it’s stopped being moist at all when taste-tested (about one hour and 15 minutes), but if you prefer it a little chewy on the inside, take it out sooner. It’s your granola. And that’s part of the beauty of cooking at home. The resulting granola is crunchy and clustery, and an ideal blend of salty-sweet. I loved this mixed into yogurt with blueberries and bananas, and it also makes a yummy snack all on its own.